Day 5 of having McKay at home and life is good. We've been taking morning walks the past few days and he seems to enjoy being outside (in his car seat, under a blanket...but outside!). He seems to be requiring a bit more oxygen to keep his sats up lately. That has me worried, but I am keeping a journal of his sat spot checks and his oxygenation levels with and without the cannula to discuss with the cardiologists next week. Hopefully they'll be able to tell us if his pattern is a normal one for babies like McKay. Many have asked exactly what is wrong with McKay's heart. We have avoided going into a lot of detail because it is a combination of several complicated congenital heart defects that are extremely rare in and of themselves and even more so in McKay's combination. But for those of you who speak the language (or want to)...here's the report. The first, most obvious difference is that McKay's heart is positioned in a reverse direction from a normal heart. That's the dextrocardia. Secondly, you'll notice how McKay has only one bottom chamber into which both top chambers of the heart empty. That's the Double Inlet Left Ventricle. 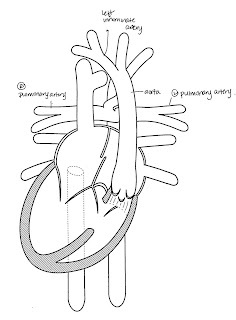 You'll also see how McKay is missing the descending piece of the Pulmonary Artery (PA). That's the Pulmonary Stenosis. The break in the separation between the two top chambers of McKay's heart (the RA and LA in the pic of the normal heart) is the septal defect. Finally, McKay's transposition of the great arteries means that the aorta and pulmonary artery are reversed. Individually all of these conditions are serious and require surgery early in life to survive. Together, they are fascinating and generate a fair amount of interest from the cardiology team at Primary's. McKay's first surgery involved receiving a BT Shunt. There is a movie about the invention of this surgery called "Something the Lord Made," if you are really interested in learning more. It's quite an amazing story of intellect and courage. The surgery involved creating a temporary conduit between McKay's left innominate artery and his right pulmonary artery to create blood flow to the lungs. The artificial pathway they created is actually just a small tube made of gortex. I have no idea how someone could insert something so small into a space so tiny to do such a big job for McKay's heart. Prior to the surgery, they gave McKay drugs called prostaglandins to keep a natural hole in the heart all babies have called a PDA from closing as it normally does when babies start to breath on their own. Lucky for McKay his PDA was larger than normal so it helped him to maintain well until surgery. All in all, McKay is healing well and is far more brave than I would be in his place. He will continue regular check ups with cardiologists who will watch his progress closely as he outgrows the shunt. They estimate he will need to embark on a more permanent fix about the time he doubles his birth weight at anywhere from 3-6 months of age. At that time he will undergo what's called a Glenn operation that will permanently connect/reroute blood flow from his superior vena cava to his pulmonary artery. They will also remove the BT shunt at that point. The final operation will occur between 2-4 years old and is known as the Fontan. That surgery will permanently connect/reroute blood flow from the inferior vena cava to the pulmonary artery. I can't imagine how hard it will be to walk him into that experience knowing what we're in for. When all is said and done McKay's heart will only have to do half the work of a normal heart. His new plumbing will automatically reroute unoxygenated blood from his body directly into his lungs. Once oxygenated, the blood will flow to the heart where it will be pumped to the rest of his body. Pretty amazing stuff, huh? So there you have it. Hopefully that answered some of your questions. Here's to gifted surgeons, steady hands and living at a time when we are blessed with brilliant medicine. I don't exactly know how to thank someone for dedicating their life to learning and perfecting techniques that will save my child, but I am indeed grateful to have that problem and will do all I can to make sure the Lord and the doctors He has led us to understand how truly thankful we are. WOW! I had no idea. I didn't totally understand it all, but I understand enough to know now that it is not at all what I thought. I agree with you, we are blessed to have the doctors and procedures we do now. I completely believe it is a miracle, and McKay is a wonderful miracle! WOW! I'm with Kimi, I had no idea. My friend's baby I was telling you about has hypoplastic left heart syndrome. It sounds like you have an amazing team of doctors. We wish you the best with your beautiful baby McKay!! You are still in our thoughts and prayers. Wow Mind! When are you getting your MD? Seriously you are so smart! Thanks for the details it helps tons to know exactly what he will be facing, and is facing right now! McKay has amazing doctors... and amazing parents! Mindi, it has been neat to follow Mckay's story on your blog! You are such a wondeful person and he is so blessed to have you for his mommy! We really take for granted the amazing miracle our bodies are, but what a miracle to live in these modern times. You've been in our thoughts and prayers. We love you! We love that movie. We are so grateful for the doctors who knew there had to be a way to fix this and were willing to accept the challenge. We will continue to keep McKay in our prayers. Mindi, thank you for that detailed explanation! wow! You HAVE done your homework. I still struggle with all of details...though I'm starting to think we all could teach a course on cardiac anatomy. I've never heard of the movie, but I'll have to rent it...I see my dh's favorite actress Kyra Sedgwick stars in it. Thanks again for the update. I'm impressed by your brain power at just a few weeks postpartum. It is great to hear McKay is doing so well. The pictures of his heart and a "normal heart" are very interesting. I guess you are getting a medical education also. It is wonderful to live in this time of medical advancements and to have surgeons, doctors, and nurses who can do so much. My prayers and thoughts are with you. I so appreciate your positive attitude and strength! Have fun with your family.